In which G.M. Norton talks Japanese designed pocket squares. While I’m not a dedicated follower of fashion, I do look forward to seeing the autumn and winter offerings from the likes of Drake’s, Simon James Cathcart and Cravat Club. Whenever anybody asks me to recommend a good source for pocket squares or cravats (or ascots if you’re in America) then Cravat Club is the first name that leaves my lips. They really do offer the best quality accessories and the packaging and customer service is second to none. 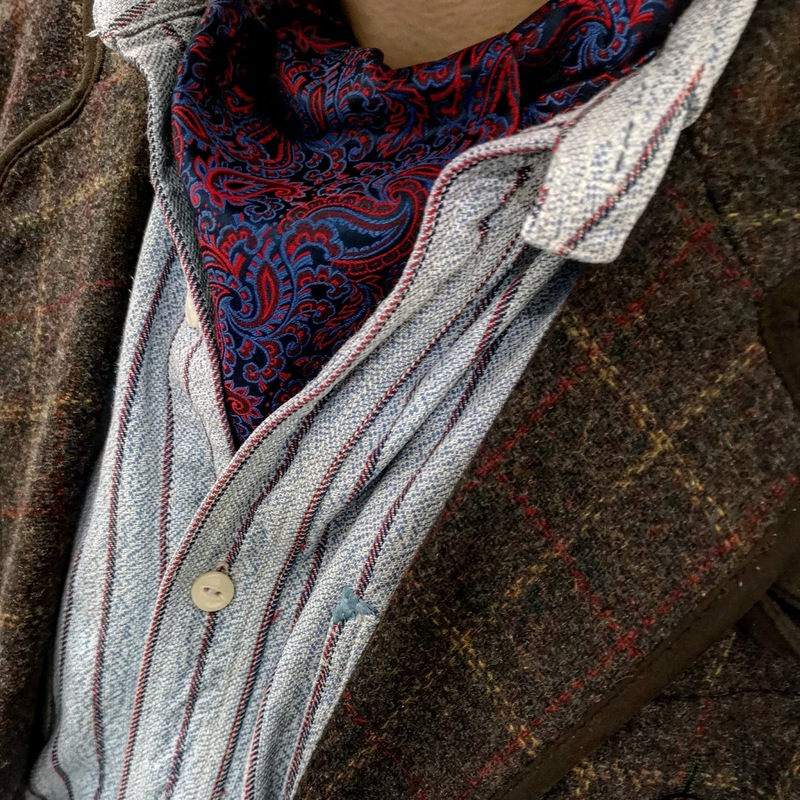 I was sent a cravat and pocket square from their AW18 collection and as always, they are absolutely stunning. So much so that I feel compelled to write about them now. 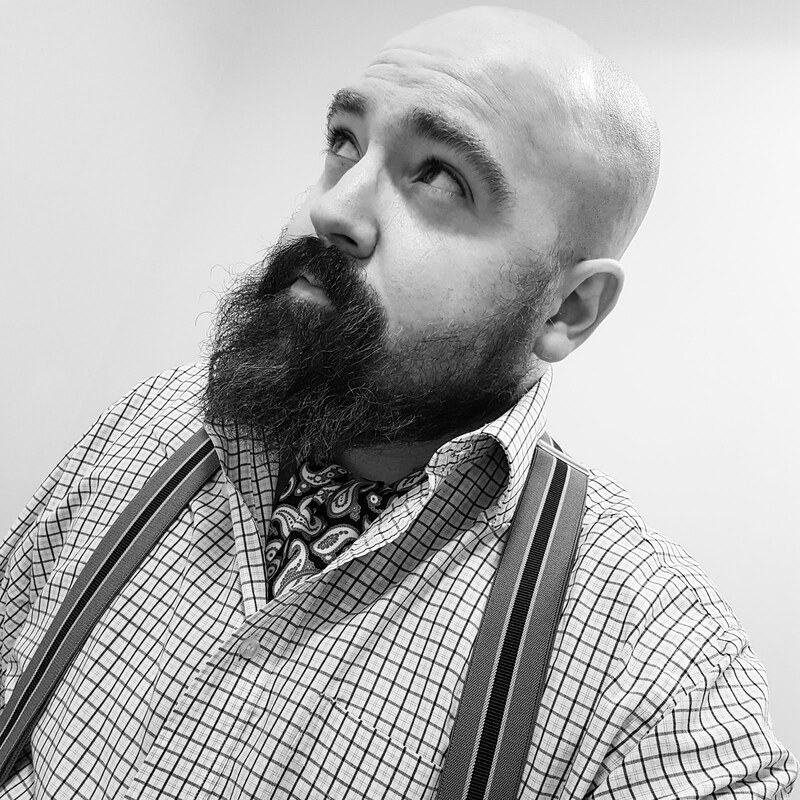 This is the cravat I received, a stunning paisley design called Zethus. 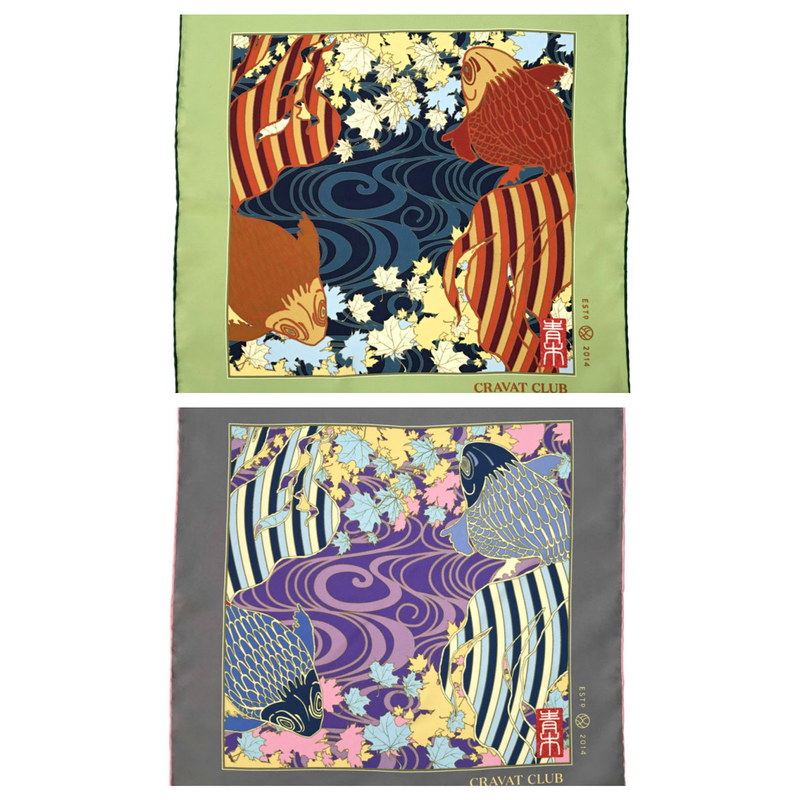 And this is the pocket square, called Tsubaki. 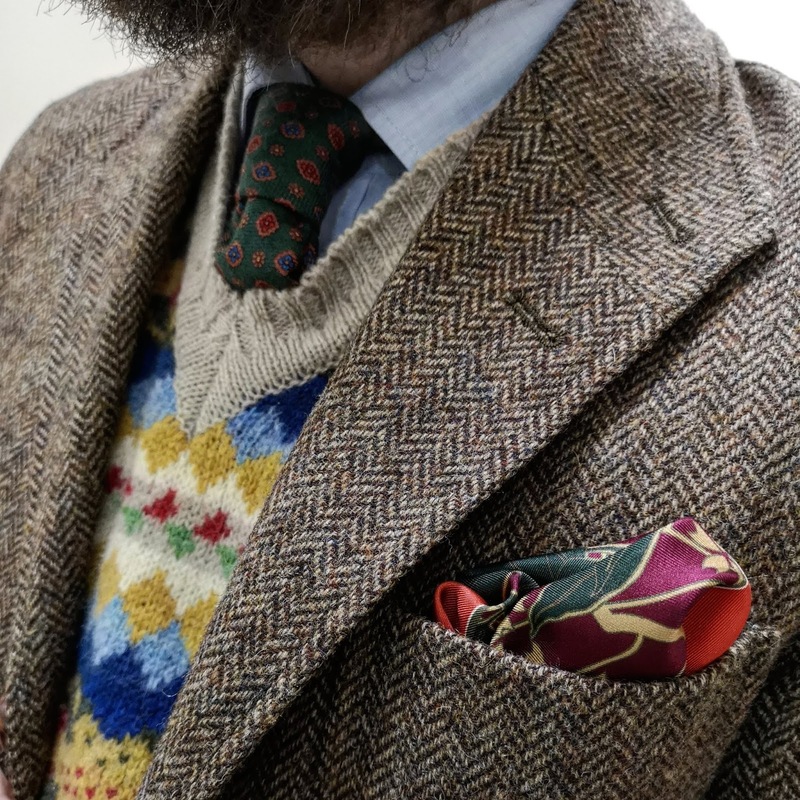 Although I’m a self-confessed cravat lover, taking part in a Cravat Week and World Cravat Day, the pocket squares really caught my eye this year. 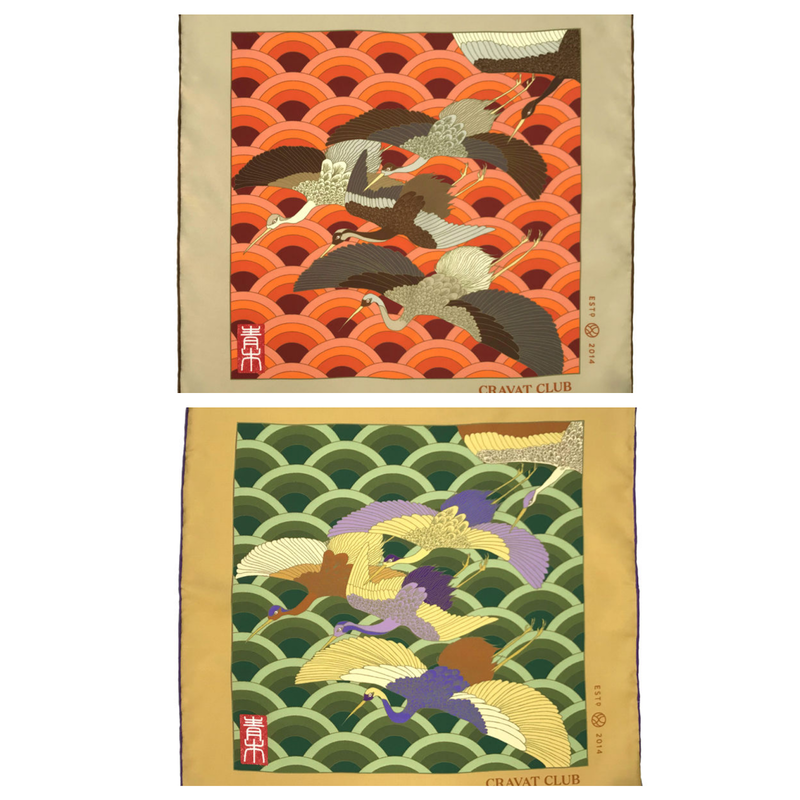 Cravat Club have released a few Japanese Ukiyo-e designs over recent years, in colourways to suit all tastes. This year, they’ve released five designs, in two colours each. Designed by Japanese artist Yusuke Aoki and printed and handcrafted in England, the pocket squares boast hand-rolled edges and are made from 16oz extra soft silk twill. They also measure a generous 16 inches by 16 inches so are not going to drop down your pocket like so many smaller sized pocket squares do. Shall we look at the designs on offer? Yes, I think we should too. This design features Toshiro Mifune, a 1950s Japanese actor. 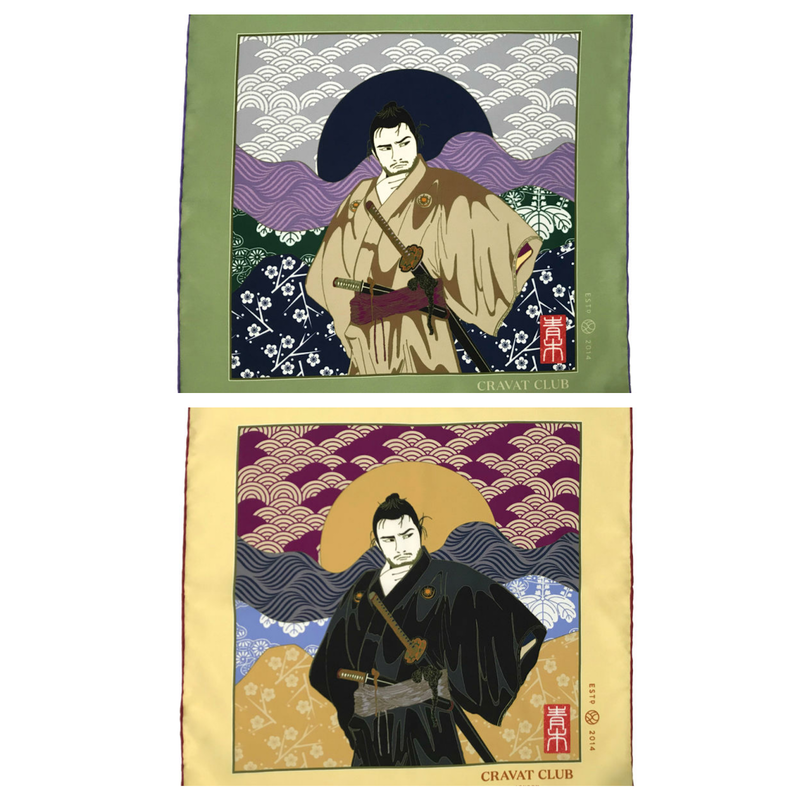 The sunglow yellow square is named after the actor’s surname Mifune and the almond green one has been called Kikuchiy, the character from the 1954 film Seven Samurai. This design features a goldfish and maple leaves. Goldfish are known as 'kingyo' in Japan, which is seen as a symbol of wealth and good luck. Maple leaves represent lovers and the passing of time. I'll never forget winning two goldfish at the fair as a child which were promptly named Peter and Goldie (Peter, after my father and Goldie after my mother whose maiden name was Goulden). Unfortunately, Peter didn't survive the journey home after a spillage in the car, but Goldie lived for many years. 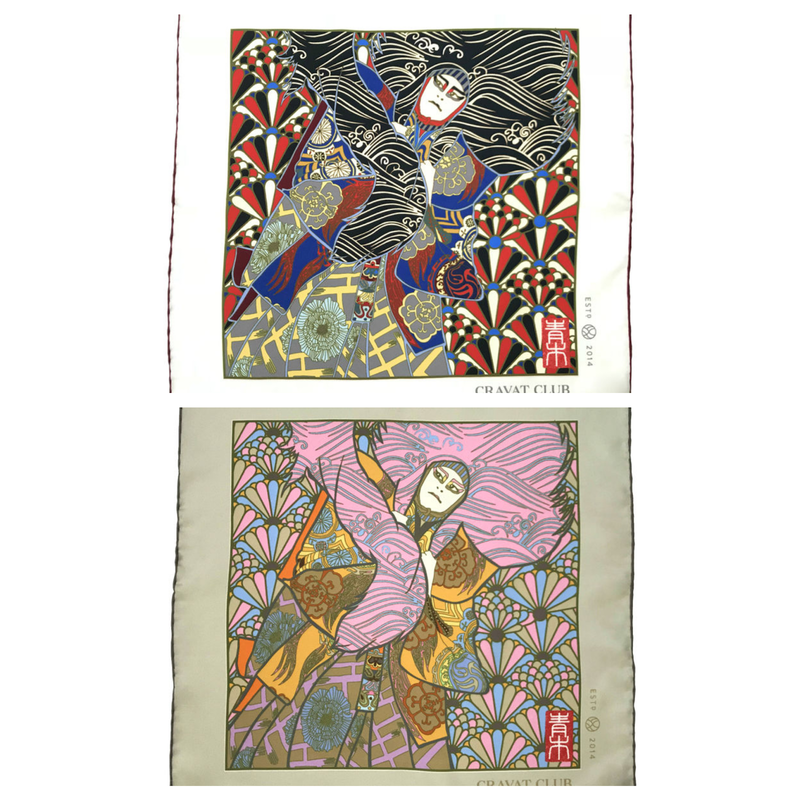 This design features a 'Shishi' lion from the renowned Kabuki play, 'Renjishi'. The play tells the story of a father shishi, who throws his son off a cliff to test his courage, strength and valour. The son survives the fall and climbs back up, with the play ending with a dance to celebrate the son's achievement. 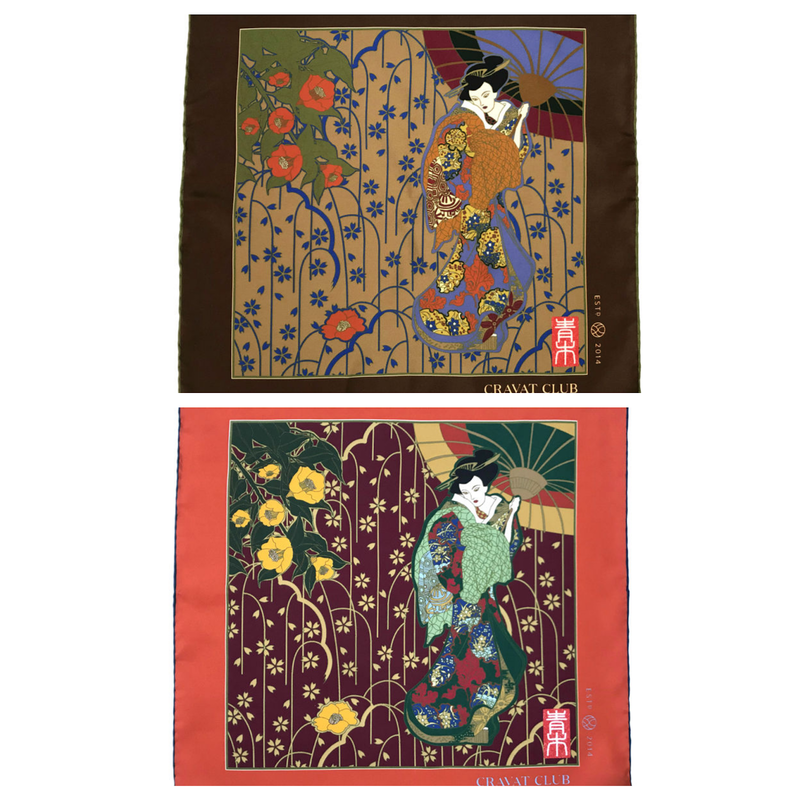 This design is my personal pick of the bunch, featuring a beautiful geisha girl glancing at a fallen camellia flower. It really is an exceptional design, a work of art in my eyes. In Japan, camellia flowers are a symbol of humility, discretion and love. This design features crane, or 'tsuru', that is perceived to be a mystical creature in Japan. Otherwise known as the 'bird of happiness', it is a symbol of fortune and longevity. 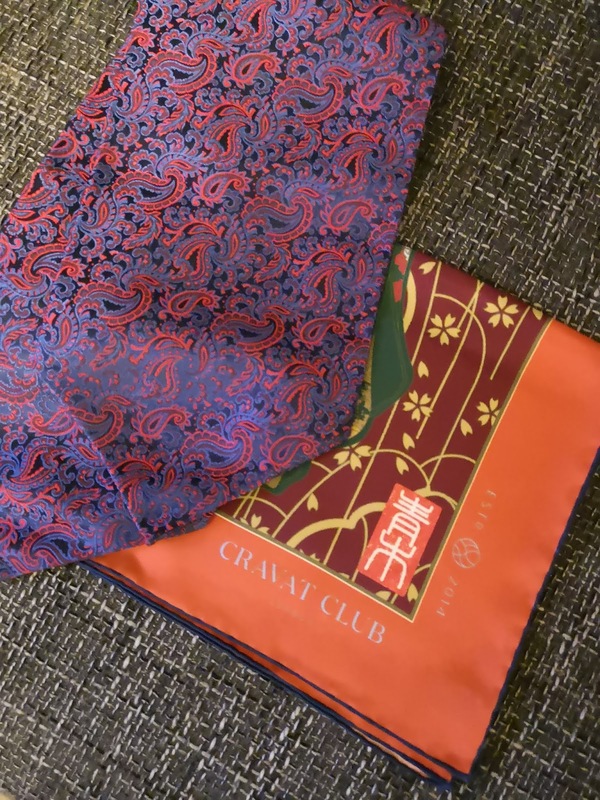 This isn't the first time that crane have featured on Cravat Club pocket squares and I can see why. Do browse the AW18 collection and see what catches your eye. Something from Cravat Club would make the ideal Christmas gift. Those are true works of art. Do you know where in England they are made? Aren't they just? I believe they're made in Macclesfield.